This backdoor is a Trojanized copy of a legitimate gaming application for Android OS smartphones. It steals sensitive information of the affected phone's SMS and calls functions, compromising the security of the device and of the user. This backdoor is a Trojanized copy of a legitimate gaming application for Android. 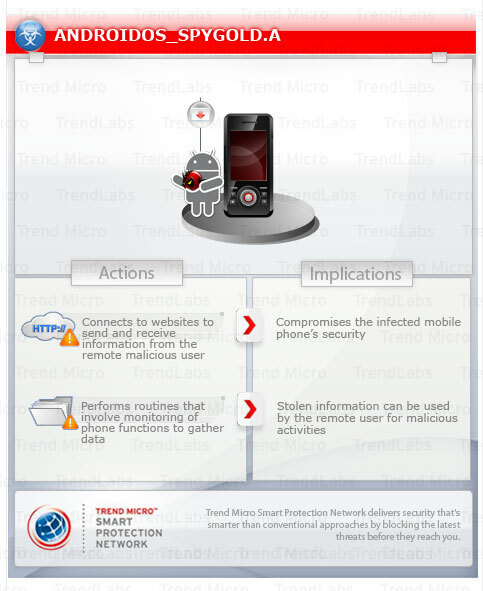 It inserts its own receiver and service into the affected phone to execute its malicious routines. It monitors the affected phone's SMS and phone calls and sends stolen information to a remote URL. It connects to a malicious URL in order to receive commands from a remote malicious user. This backdoor may be manually installed by a user. This backdoor is a Trojanized copy of a racing game. The malware inserts its own receiver and service to execute its malicious routines. 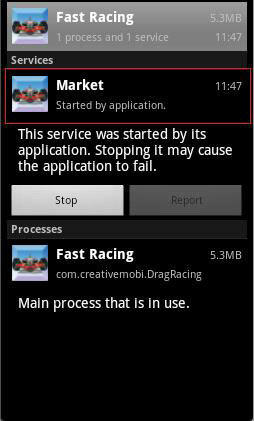 When the phone boots or the BOOT_COMPLETED action is triggered, it will start its service named Market. The service is named such so that users are deceived into thinking that it is a legitimate service. It monitors the incoming text messages. Once a message is received, it will record the message body and the sender's phone number to a text file named ZJSMS.TXT. It is also capable of updating the site it uses. New Android Malware on the Road: GoldDream "Catcher"